Join us on a private sunrise or sunset flight for you and one or two companions (based on weight capacity restrictions). 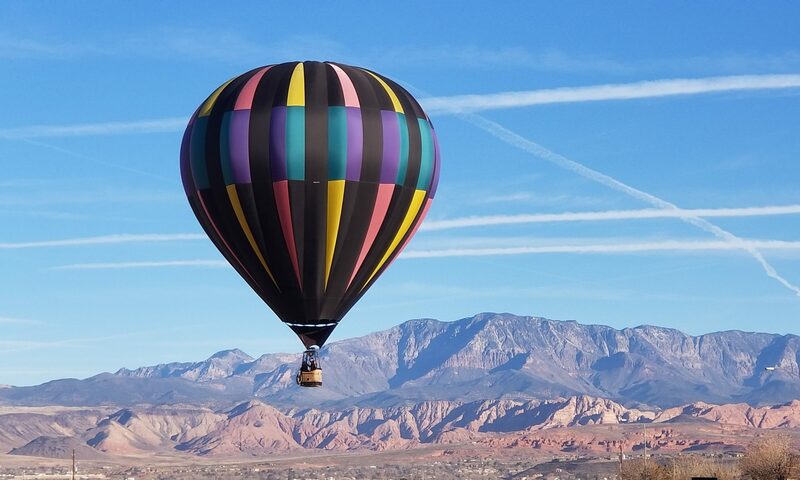 You will gently float over the beautiful Fox Valley countryside in our colorful balloon, while waving and talking to the people who stop on the side of the road to take in the magic of the balloon floating overhead! After landing we celebrate your amazing experience with non-alcoholic sparkling juice. You will also be presented with a personalized flight certificate! The flight normally lasts around 45 minutes to 1 hour! The entire experience of set-up, flight, pack-up and celebration lasts around 3 hours. Our ground crew can also transport a small number of your family and friends to be at our landing site to share in the post flight celebration of your engagement! We will have a bouquet of flowers waiting for you at landing and you will each receive a champagne glass with our logo printed on it, as well as a personalized flight certificate following the post-flight celebration! Our crew will take photos from the ground and the moment will be captured via our on-board camera(s) for you to remember this event for many years to come! Just like our private flight experience, this flight also lasts around 45 minutes to 1 hour with the entire experience of set-up, flight, pack-up and celebration lasting around 3 hours. Perfect for weddings, and for corporate, church, or private events! Tethered flights are balloon flights in which the balloon is tethered to the ground while allowing for the balloon to lift off and then land in the same location multiple times. Tethered flights are a great way to give a large number of customers, members or guests the experience of being in a hot air balloon in a short period of time. Each flight lasts about 5 minutes and the basket rises 40-50 feet in the air above the crowd! Static displays are a great way to draw attention to your event! People are drawn to the sight of a hot air balloon and will be drawn to your event as they come over to see our colorful balloon. We can attach a banner to the balloon with your organizations information on it. The balloon basket never leaves the ground during a static display. What better way to have your business or group recognized! Hot air balloons draw a lot of attention so why not use that to the advantage of your business. We can fly a banner on our balloon with your business or group name, logo or message on it. We also can provide hot air balloon flight instruction and flight reviews. Please call or email us for details and pricing for static displays, tethered rides, commercial advertising and flight instruction.